Disclosure: This post IS being shared AS PART OF a Bloggin' Mamas Social Good campaign. Social Good campaigns are voluntary campaigns in which the blogger shares the post for no monetary compensation. Do you remember where you were when Hurricane Andrew hit Florida? BB was in her house with esposo #2 and The Trio. Thankfully La Tata was in a hospital recovering from an operation and wasn’t staying with us at the moment. Why does Babushka say thankfully? Because it was scary enough having to be brave and calm for my children, but hurricane preparedness wasn’t taken that seriously back then, and there was no way BB would have known what to do about someone with a medical condition or disability. Through the double edged sword that was Andrew we’ve all learned to take emergencies more serious and are hopefully better prepared. Practice your plan with your support network, just like you would a fire drill. Discuss your needs and/or the needs of a family member; learn about their assistance requirements or the services they depend on. Advocate including people with disabilities and others with access and functional needs into emergency planning in your community. Created pro-bono by Free Range Studios, “We Prepare Every Day” shows whole community and individual emergency and disaster preparedness as a part of everyday planning. One of the goals of the PSA is to encourage all Americans to “Be Informed, Make a Plan, Build a Kit, and Get Involved.” Resources and guidelines on how to do this can be found at Ready.gov/MyPlan. First, you need to be informed about potential emergencies and disasters where you live, work, or visit. Then, you can go about making a plan that fits you and your loved ones. Making a family emergency communication plan with your friends and family before a disaster occurs is important. Why? Because it will help you answer questions: how will you get in touch with each other? How will your family get to a safe place? It's important to make a plan now so that you will know where to meet, how to find each other following a disaster, and how to communicate in an emergency that works for your family’s specific communication needs. While each person’s abilities and needs vary, everyone can take steps to prepare for all types of emergencies. By evaluating your own individual needs and making an emergency plan that ﬁts those needs, you and your loved ones can be better prepared. For example, if being without access to medications, help, or other services you need to maintain your health, safety and independence for even a couple of hours or days could be devastating, and you need to be prepared more than ever. People with disabilities are encouraged to take a seat at their community and local government- level planning tables. Planning for emergencies and disasters with people who have disabilities and others with access and functional needs rather than planning for them will allow us to understand and address the needs of the whole community in a disaster. 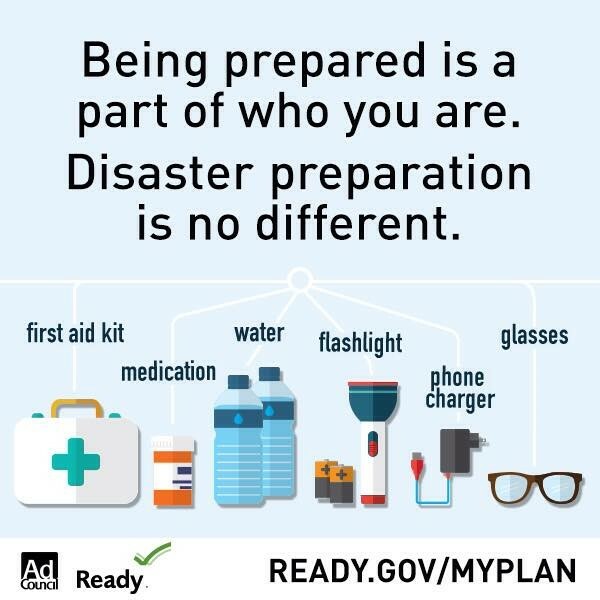 Ready.gov/Prepare has information about natural disasters including Hurricanes, Floods, Earthquakes, Tornados, Wildfires and Winter Storms as well as tips about how to prepare." There’s some excelente information there Beautifuls. Also keep in mind that those links may take you to great sites, but maybe you should print some out now while you still can. Oh Si, BB get caught again unprepared? JU SO FONII!! !